Elisha is just 9 months old but her body is covered in scars from multiple surgeries. Her life is nowhere close to normal. Instead of being in a cradle playing with toys and a musical mobile, she is fitted with wires and tubes. Elisha was born with short bowel syndrome. Her small intestine is almost nonfunctional. When Cynthia was 8 months pregnant, a sonogram revealed that her baby had a cyst. Both Paul and Cynthia were hopeful that it will heal by itself and the doctors gave them hope. When Elisha was born, these parents were shocked to see that their worst nightmare had come true. It had not healed, and it had gotten worse. A day after her birth, Elisha started vomiting in yellow and greenish color. Her blood pressure was too low. She also had several infections and had jaundice. 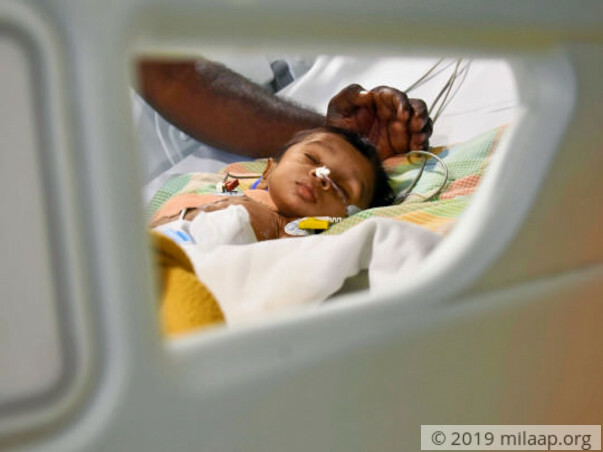 They were at a hospital in Dindugul and immediately rushed the baby to Apollo in Madurai where they waited till jaundice settled down. 7 days old, Elisha had to go through a surgery that removed 90% of her small intestine. Now her body is unable to absorb any nutrients from her food owing to the reduced length of the small intestine. Since then she is on the total parenteral nutrition (TPN) for survival. After the surgery, she again got infections and jaundice. Her weight dropped drastically. Finally, doctors gave up and asked the parents to take her home. Paul Raj and Cynthia did not want to give up. To everyone's surprise, Elisha began gaining weight, and started taking milk. When she showed some signs of improvement, doctors said, they can continue the treatment. Baby Elisha's condition became worse in few days. 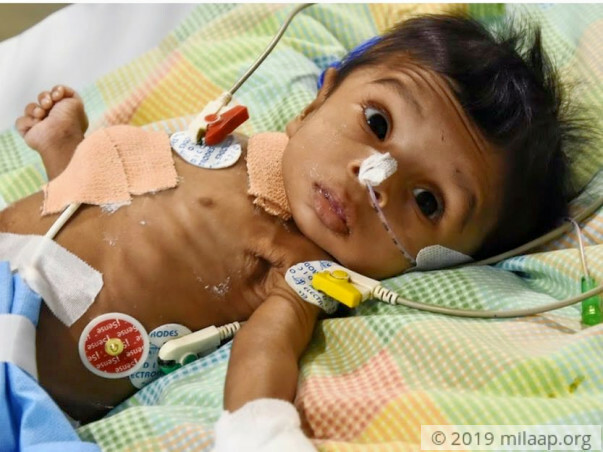 Acidity in the blood increased until she began having severe diarrhea and sepsis. The doctors said this has also affected her brain to a small extent. Elisha needed the ventilator to survive. Cynthia is literally spending her days and nights in the hospital. Paul has no other option but to work despite the stress because he is the sole breadwinner of his family. Cynthia is both physically and emotionally exhausted. Their only hope is the bowel transplant that will save their daughter's life. Bowel transplant is quite rare in India. Paul works for a private company and has exhausted all his savings. He has already spent nearly 17 lakhs and has no other support system. He has come a long way but is still short of saving his baby. 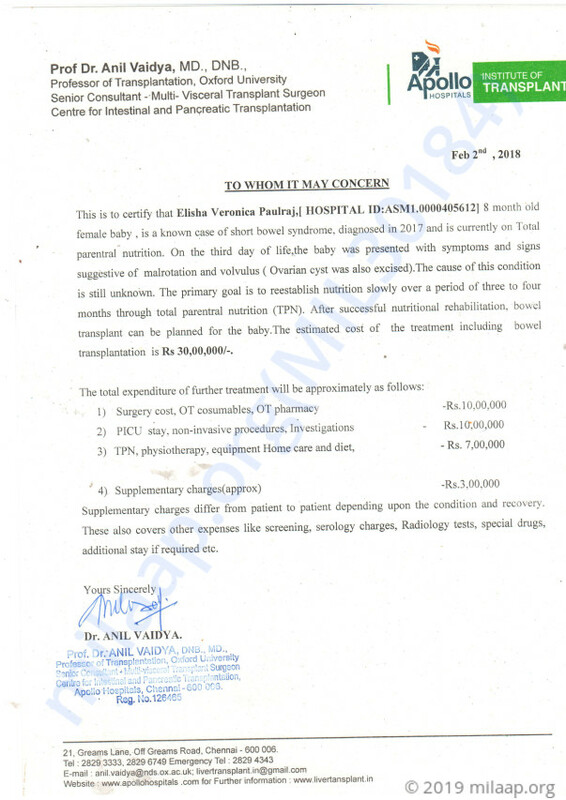 Baby Elisha needs an extensive treatment and a bowel transplant which is very expensive. He needs 30 lakhs more which is beyond his means. This baby girl has hardly seen life. Your contribution can gift this fighter a new life. Thank you for love and support. We couldn't imagined giving Elisha the best medical support if you hadn't helped us. With inexplicable grief, I'm having to inform you all that baby Elisha passed away on 19th May, 2018. She had developed sever lung infection. This complicated the treatment and she eventually started having trouble breathing. Even after giving the right treatment, we could't save her. Her lungs stopped responding. Thank you everyone for being so supportive. It means a lot to us. Thank you so much for your tremendous support and love. We really couldn't have come this far without you. My baby, Elisha, is currently not doing very well. She is put on high frequency ventilator because the normal ventilator that she was earlier on, wasn't supportive enough. The doctors are hoping to improve her oxygen level so she can be put back on the normal ventilator. There is infection in her lungs which is causing complications. We admitted her in the hospital on Friday and on Saturday evening, around 7 PM, her health started worsening because of the infection. Please keep supporting us so we can help our baby survive and keep praying for us. Thank you for the wonderful love and support that you have shown towards Elisha. She is doing better now compared to earlier but has been readmitted to the hospital as she has developed fever and other minor infections. She is being treated for the same. Her weight is on an increasing trend and she will be needing PICU support until she stabilizes. 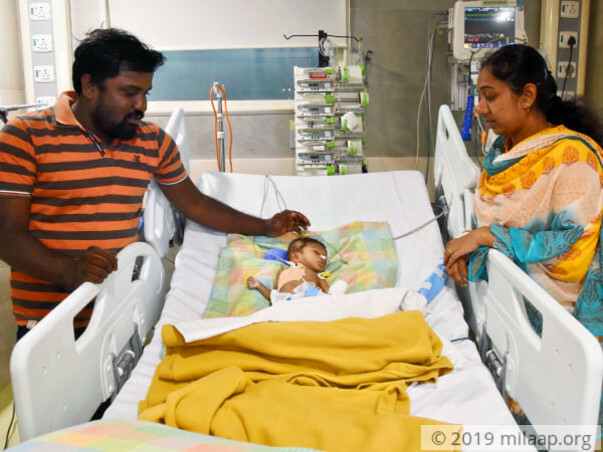 As per the doctor's advice, she is on TPN; she is being administered nutrients artificially as her body is not able to absorb the nutrients naturally. She will be discharged soon from the hospital and her parents have been trained to provide care at home. They will also be taking assistance from a full time nurse to provide Elisha the best care and treatment possible. This will help them in reducing the costs a little bit but providing her with the best treatment. Thank you all once again for all the love and support. Do pray for her health and speedy recovery. Would request you to share this campaign further with your friends and family to help them in raising funds faster towards her treatment. Will keep you posted.